Guests will enjoy the full kitchen, stocked with utilities including coffee maker and microwave. A nice countertop bar seats two while the additional dining area fits up to four. The large living room is nicely furnished and includes television and direct access to the outdoor balcony with views of John's Pass Village. There is also a sleeper sofa in the living room. Both bedrooms offer plenty of room, with each containing two full size beds. The bathrooms are meticulous and linens, extra towels and pillows are stocked for your visit. You won't have a worry in the world when you reserve this delightful condo that is ready for your friends and family. When staying in a SunHost unit you will also have access to 7 day a week office staff, office services (fax, copy, print boarding passes etc.) We also have maintenance available 7 days a week if you experience any issues at the property and a 24 hour emergency on call person. This is a non smoking property. One big attraction to this popular unit is its premier location to not only the world class beaches, heated swimming pool, spa and BBQ facilities, but also it is just across the street from John's Pass Village, a sought after destination for tourists and year round residents alike. The Pass is a quaint turn-of-the-century fishing village and has over one hundred unique shops, a variety of restaurants, the local fishing fleet, dolphin watching and shelling tours, boat rentals, parasailing and jet skiing. Best of all as a SunHost customer you can walk to this great entertainment destination. Anchor tenants include Bubba Gumps, Hooters and Hubbards Marina and also world famous Bamboo Beer Garden. Traffic and pool party very loud. Noise from traffic on Gulf Blvd was very loud and annoying also late night pool goers (1am) on a couple of nights woke us with their loud screaming, laughing and yelling. Pool area was monopolized during the day by a large party with a lot of alcohol flowing, cigarette smoke, cigar smoke and very loud country/western music blasting on their speaker, for several days of our stay. Add to that the dead fish smell from the red tide and it was an unpleasant stay. The wi-Fi is not very good, it's so slow. The kitchen was not very equipped, didn't have hardly anything, no hot pan holders, no electronic frypan, no cookie sheets. Our condo is in serious need of updating, especially the kitchen and bathroom. Every bedroom needs to have queen beds, full size beds just do not have enough room for 2 adults. We had several inconveniences. #1 was we could not use the main bathroom due to a toilet leak. The floor was flooded. With 8 people this was difficult. #2 The Freezer was not working. Our ice cream was like soup. #3 the furniture was worn and very dirty. 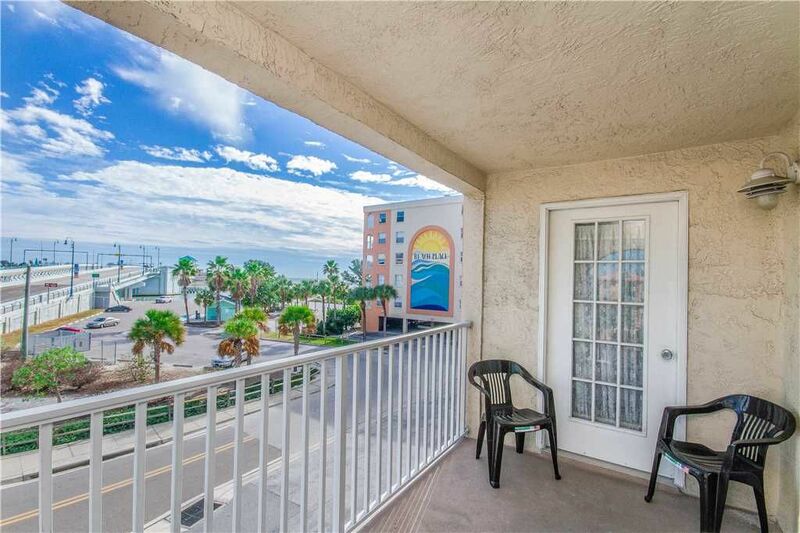 Although it was nice to be so close to John's Pass and the beach the noise was horrible-- one bedroom was flooded with the busy traffic on the bridge and the other bedroom was right be the elevator and trash chute. The condo was large and had plenty of space, but it was very dated and worn. Carpet and the sofas were dirty. The beds were not comfortable (mattress and sheets) and the kitchen was minimally furnished. There were no blankets and no bedding for the pull out sofa. I am sad to say, that i would not consider rebooking.